As of 2010, approximately 30% of all deaths in Japan are attributable to malignant neoplasms, or cancer. From around the early 1950s, the proportion of death from cancer in Japan shot up rapidly, becoming the second most common cause of death by 1953, and the first most common by 1981. This trend is not unique to Japan, however; improvements in medical treatment and technology have helped to significantly reduce the number of people dying from diseases other than cancer, particularly infectious diseases, and therefore there is no suggestion that Japan suddenly has a much higher rate of cancer than it did before. What can be said is that the cancer treatments available in Japan at that time were lagging behind those in other countries; oncological research, too, was far off the global standard. The National Cancer Center takes as its mission the suppression of cancer in Japan. Established by the government of Japan in 1962, under the support of Dr. Taro Takemi who was the President of the Japanese Medical Association at the time, the Center is dedicated exclusively to providing cancer treatment and pioneering cancer research. Since its foundation, the National Cancer Center has dedicated itself to three main areas: clinical service, research, and education, namely the improvement of cancer knowledge and awareness among the Japanese population. Dr. Takemi, who was the driving force behind the foundation of the Center, established three organizational entities, each responsible for one of these three main areas: the Hospital, the Research Institute, and the Administration Department. The scope of the Administration Department first suggested by Dr. Takemi has expanded; it is now responsible for more than just raising awareness about cancer among Japan’s population. It also functions to synchronize the activities of the Hospital and the Research Institute, and allows these two facilities to concentrate more efficiently on practical clinical and research activities. Dr. Takemi was determined that the Center should push forward with ground-breaking cancer treatment and research without becoming distracted by academic cliquishness and factionalism. For this reason, Dr. Takeo Tamiya was selected as the very first Center President, thanks to his neutral position in Japanese medical society at that time. In addition, other physicians selected to lead the Center were Dr. Masaru Kuru, who became the first Director of the National Cancer Center Hospital, and Dr. Waro Nakahara, who headed up the National Cancer Center Research Institute as its inaugural Director. When first established, the Center Hospital, under the influence of Dr. Takemi, brought together outstanding physicians from leading universities throughout the country, with selection based solely on ability and regardless of academic affiliation. Leading physicians are often very driven and determined, and during the early days of the Center Hospital there was a tendency for personal goals and processes to supersede Hospital objectives and protocol. Under the determined command of Dr. Kuru, however, and with the friendly rivalry between Hospital doctors accelerating the pace and quality of research, a unique system of treatment grounded in pioneering cancer therapies was developed at the Hospital. In general, research institutes affiliated to hospitals concentrate principally on clinical research. Despite this, Dr. Nakahara, the first Director, was determined to recruit staff with strong skills in basic research. There was some initial concern as to whether such an approach would translate into outstanding research achievements, but Dr. Nakahara’s decision has certainly paid off; the National Cancer Center Research Institute has been responsible for many great and diverse achievements in cancer research, in the clinical research field and beyond, specifically thanks to its strong grounding in basic research. The National Cancer Center has three primary goals: treatment, research and the improvement of public awareness. In its first decade, it quickly established itself as a leading force in cancer research and treatment, recording such impressive achievements as the development of early diagnosis methods for stomach and lung cancer, and safe surgical procedures for liver cirrhosis and liver cancer. The Center has also established a strong international reputation; in 1968, it provided significant assistance in the establishment of the National Cancer Institute of Thailand, and in 1971 founded the WHO International Stomach Cancer Information Center. Participation in such activities continues to ensure that the Center is subject to significant attention and expectation from the international community. At present, the National Cancer Center provides patients with three treatment options, either independently or as an integrated treatment program, as each case requires. Each treatment option - surgery, chemotherapy or radiotherapy - offers patients the very latest in advanced medical technology and techniques, as is only fitting for a specialist cancer facility. 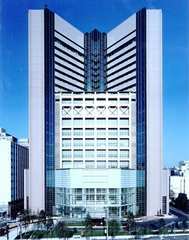 The National Cancer Center is equipped with advanced technological capabilities that allow it to provide surgical options, conventionally considered the most effective method of cancer treatment, as well as radiotherapy, which is increasingly becoming the most common form of new cancer therapies, both in Japan and abroad. Japan has been the world leader in the research and development of radiotherapy. The National Cancer Center established the Proton Therapy Wing in 1997, and also became the second hospital in Japan, after Tsukuba University Hospital, to have available for clinical use proton therapy equipment. It is facilities such as these that allow patients to receive both surgical and radiotherapy-based cancer treatments, requiring with advanced technology and the very latest medical devices, available in few other hospitals in Japan. The three conventional cancer treatment options are surgical operation, chemotherapy and radiotherapy; all other cancer treatments are referred to collectively as alternative therapies. These alternative treatments have generally been considered less effective than the three conventional options. In recent years, however, medical scientists at the National Cancer Center have been working on some revolutionary research in this field. The current Director of the National Cancer Center Research Institute is Dr. Yusuke Nakamura, whose main topic of research is the development of vaccines able to artificially boost levels of cytotoxic T lymphocytes (CTLs), immunocytes which work specifically on cancerous cells. These vaccines are referred to as cancer peptide vaccines, as they contain peptides which are only produced by cancerous cells. By injecting patients with peptides from cancerous cells, CTLs are encouraged to multiply, thereby boosting the cancer-resisting immune system of the cancer patient. The treatment method does not simply boost immunity in general; it is designed to specifically work on the immune responses of the patient to cancer, making it significantly different to immunotherapies used up until now. Dr. Nakamura’s research is the subject of intense international interest. This cancer peptide vaccine treatment is currently being utilized in clinical research programs at several leading university hospitals in Japan, in addition to the National Cancer Center. Expectation is high that this pioneering therapy holds great potential as a new cancer treatment in the future. The National Cancer Center also takes proactive measures to raise cancer awareness among the Japanese population. In 2006, the Center for Cancer Control and Information Services was established. Today, the Center runs a dynamic program of cancer awareness activities. Equally, the Research Center for Cancer Prevention and Screening works to provide information to Japan’s population on the importance of cancer prevention and early diagnosis. 1889-1963. Physician, medical researcher. After graduating from Tokyo Imperial University, Tamiya took a position at The Institute of Infectious Disease at Tokyo Imperial University, today known as the Institute of Medical Science of The University of Tokyo. He carried out research on rickettsial diseases such as typhus, with his significant achievements in research being recognized in 1959 when he received the Takeda Medical Award. He worked as a Professor at The Institute of Infectious Disease, and was Professor Emeritus after his retirement. He also served two terms as the President of The Japanese Association of Medical Sciences. He became the inaugural President of the National Cancer Center at its opening in 1962. 1896-1976. Medical researcher. After graduating from junior high school in Japan, he moved to the USA to study biology at Cornell University. Having been awarded his Ph.D., he took a position at the Rockefeller Institute, where he worked on cancer research. He then held positions at The Institute of Infectious Disease at Tokyo Imperial University (currently the Institute of Medical Science, The University of Tokyo), at the RIKEN Foundation, and the Japanese Foundation for Cancer Research. In 1962, he became the first Director of the National Cancer Center Research Institute. During his time as Director, Nakahara oversaw the publication of many outstanding research achievements, including the extraction of toxohormones from cancer cells. He remains internationally acclaimed to this day as one of the pioneers of modern cancer research. 1902-1970. Physician, medical researcher. After graduating from Tokyo Imperial University, he worked at the hospital affiliated to the Japanese Foundation for Cancer Research before moving to Germany to pursue further research. On his return, worked as a Professor at Kanazawa Medical University and Osaka University, becoming the first Director of the National Cancer Center Hospital in 1962. He is remembered as a talented surgeon, a leading medical researcher in cancer, and a neurologist. His research into pre-cancerous states, the auto-acceleration of carciogens, and sensory conduction pathways remains influential today. 1904-1983. Physician. After graduating from Keio University, he worked under Yoshio Nishina at the RIKEN Foundation on research into radiation. He also opened a clinic, which he ran alongside his research activities. As well as being a general practitioner, Dr. Takemi also established himself in high-level political circles. In 1957, he was elected President of the Japan Medical Association, a position which he subsequently held for 25 years, or 13 terms. He was highly influential throughout the three core Japanese medical associations, namely the Japan Medical Association, the Japan Pharmaceutical Association and the Japan Dental Association. He was also an influential voice in medical politics, at times engaging in fierce debate with the former Ministry of Health and Welfare on the most important medical issues of the day (the Ministry of Health, Labour and Welfare today). Takemi was the driving force behind the establishment of the National Cancer Center. Born in 1950. Physician, medical researcher. After graduating from Tohoku University, took the position of professor at Yamagata University in 1996. Between 2003 and 2010, he was the Director of Yamagata University School of Medicine. During his time at Yamagata University, he dragging Yamagata University Hospital back into the black, expanding its scope, and introducing innovative new technologies and equipment. His success at Yamagata led him to be selected as the new Director of the National Cancer Center Executive Board in 2010. Since his appointment, he has been working on improving the Center, under its new slogan of "All Activities for Cancer Patients". He is also involved in clinical research on malignant brain tumors. Born in 1952. Medical researcher. After graduating from Osaka University, he traveled to the USA to continue his research. He specializes in genetics-based cancer research. After retuning to Japan, in 1991 he discovered the colon-cancer- suppressor gene ATC. In 1995, he became Director of the Human Genome Center of the Institute of Medical Science, The University of Tokyo. Since 2010, he has also been the Director of the National Cancer Center Research Institute. He is internationally renowned as the leading researcher in cancer peptide vaccines.